When we play a game, we understand there’s a chance we will lose. We want to win, because winning gives us opportunities to become the champion, to become more popular, to have more power. There is a lot to be said about winning. 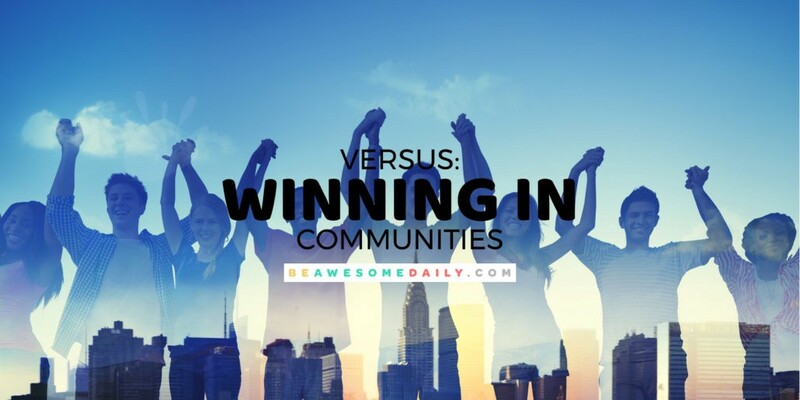 When it comes to communities, though, winning takes on a different meaning. In order for a community to win, there must be a different approach to winning. One in which the idea of winning doesn’t measure success by how many losers they’ve left in their path to the top. Too many losers in the community brings everyone down. A community — big or small — is responsible for creating an environment that measures success differently. Sentiment, quality of life, reputation, culture, accessibility, just to name a few. In order to improve these areas, communities need leaders who recognize that you can’t use the same metrics for quality of life for everyone. Each member of the community has different needs. If the community leaders focus too much in one direction, focusing on the tangible, easy to see measurements of success, they will easily forget that there are the less visible, non-obvious aspects of their community that will begin to decline. It’s easy to rattle off the wins. To show the great strides being made in unemployment, or real estate development. But the hard work starts when we want to improve things that are harder to measure. Sentiment, quality of life (for everyone?) reputation, culture, accessibility. It’s a place most winners don’t want to go. Because they are unsure how they will be able to win, in a game that has no clear grid for measuring success. It’s easier to focus on what we’re good at, than it is to find a way to become better at the things we are not. But this is a fallacy — this is how we become (and stay) mediocre. In the end, if we want our community to win, we have to look beyond the easy to see, easy to measure, and start to find ways to improve the things that will impact our community in more subtle, less obvious ways. And, this might mean losing for awhile. But if the end game is a better community, the results of the effort will be more winning. The legacy of our community, then, will be one that serves the future generations — with strength, resilience — valuing the hard work it takes to do the best thing for the community they will soon serve as leaders. If we’re playing to win, we have to remember — We are all on the same team. Originally published at Be Awesome Daily. Chief Encourager at BeAwesomeDaily.com | altMBA12 | LightBringer, CityMaker, World Shifter, GameShaker, Believer in the Power of Love.